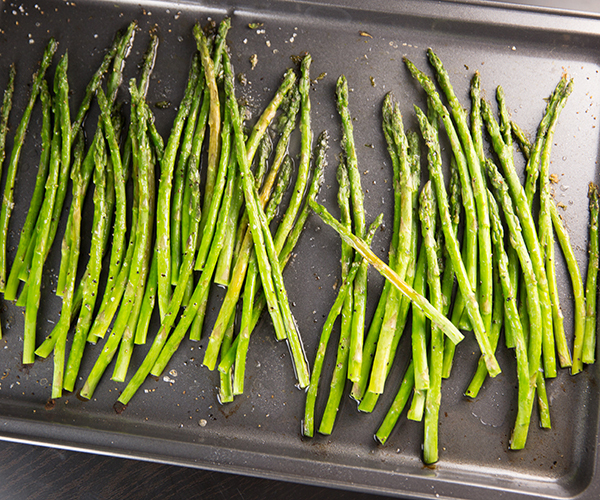 Tender Oven Roasted Asparagus will soon be your favorite way to prepare asparagus! It’s ready in 20 minutes and only requires olive oil, salt, and black pepper. You can dress it up by adding parmesan cheese, garlic, or even fresh lemon juice! The roasting adds a depth of flavor that can’t be beat! Roasting asparagus may not be the most common method for cooking it, but let me tell you, it is by far my favorite because the roasting adds a depth of flavor that you can’t get any other way. Have you ever roasted asparagus before? I almost feel silly sharing this recipe with you today because it really is so simple, and there’s not a whole lot to it. 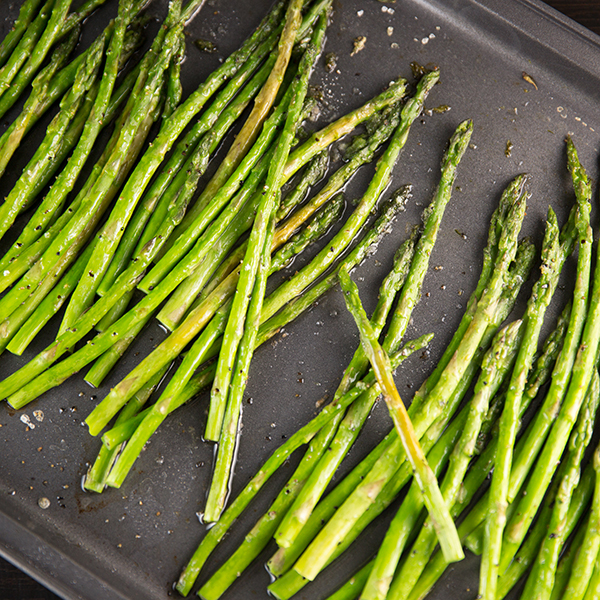 You simply toss the asparagus with olive oil and season it with salt and black pepper, then roast it until it’s tender and delicious which only takes about 18 minutes. There are a few tasty ways to dress up this Roasted Asparagus. One of my favorite ways is to sprinkle finely grated parmesan cheese (use a Microplane grater for the best result) over the asparagus right after it comes out of the oven. The cheese melts and adds an extra layer of flavor that’s to die-for. Another fun variation is to roast the asparagus with some minced garlic, or hit it with a squeeze of lemon juice when it comes out of the oven. All three of these variations are delicious! As I mentioned earlier, you’ll only need to roast the asparagus for about 18 minutes which means that this is an ultra-easy super fast side dish that pairs perfectly with so many meals. Most recently I made it as a side dish to go along with my Roasted Chicken with Lemon and Garlic. It pairs perfectly with any meat, really; beef, chicken, pork. I’ve also served it with my Pan Seared Pork Chops with Mushroom sauce and it was delicious! Make sure to use a rimmed baking sheet (also known as a jelly roll pan). You don’t want to have to worry about oil dripping off the pan and making a big ole mess in your oven. Ready in under 20 minutes, Roasted Asparagus is a great side dish your whole family will love. Rinse the asparagus and trim off the hard ends. 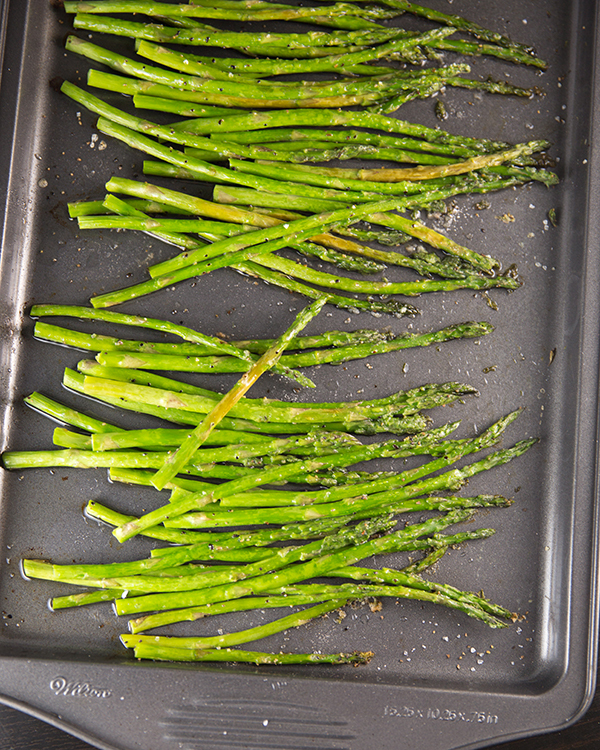 Toss the asparagus with 3 tablespoons olive oil, 1/2 teaspoon sea salt and 1/2 teaspoon black pepper.. Arrange it in a single layer on a rimmed baking sheet. Roast for about 15-18 minutes, or until the asparagus is tender. Options: Sprinkle with finely grated parmesan cheese after it comes out of the oven OR squeeze a bit of lime juice over the cooked asparagus.